I keep promising myself and others not to do any more “political” pieces for awhile. Then another Republican opens his mouth. I’m learning that every time one dunderhead says something dumber than anything I believe I’ve heard before, I can bank on a new one who won’t keep the public waiting 24 hours to say something even stupider. 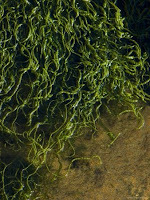 They surface like seaweed. I know Republicans don’t have a corner on stupidity, but they’re making a grand old effort to make it look like they do. Enter Chuck Grassley, Republican of Iowa, U.S. Senator. Dumb as grass. But mesmerized by a shiny object—a microphone—he couldn’t stop there. Classy doesn’t rhyme with Grassley. (We’ll leave “Chuck” alone.) When the most intelligent thing a man says in 66 words is “uh,” you have to wonder: Why can’t Republicans teach their brethren how to speak? Whenever I encounter Rush Limbaugh gorging on trash talk, I wonder that he puts food in that same mouth. Some cultures characteristically speak in poetic or flowery phrases—on the face of it a cultured and all in all admirable trait. But I believe they seduce themselves with it. I’ve always thought that was a major part of the problem in negotiating with the Arabs—what they say sounds so good to them as they say it, it becomes gospel. So it is with Republicans, teachers’ pets all, who lingered in the classroom long after the bell tolled, hanging on the precious rhetoric of Ronald Reagan and the absent syntax of George W. Bush with the same awe-baited breath when they should have taken a few extra-curricular speaking lessons from the likes of someone who speaks sense, not spin. Enter Barney Frank. As out of hand as St. Patrick’s Day in New York can be, it used to be worse. Twenty years ago, I was escorting an Israeli couple through mid-town Manhattan. The husband, a friend of mine from Israeli Intelligence, had been to New York many times. It was his wife’s first visit. I had thought to point out St. Patrick’s Cathedral, but had forgotten—had completely overlooked—that it was St. Patrick’s Day. My intelligent Intelligence friend said, “What amazes me more about New York than the crazy, eccentric things that go on in the streets here every day is that you New Yorkers don’t even notice! He was right. Heads don’t turn. (Did they ever?) We who live in New York City live so long among some things so bizarre we fail to notice anything different about them. A man wearing only a cowboy hat, jockey shorts and a guitar struts in Times Square and never frets even in the dead of winter, posing for tourists who take photos of him and with him, never noting that the midday cowboy never strums his frets because he can’t play guitar. But New Yorkers?... pay him no mind. Let’s put it to rest once and for all—John McCain is not a nice guy. None of the multiple-personality John McCains are company you’d want to keep. He’s a malevolent senator who was a duplicitous presidential candidate who was a self-promoted maverick who, aided and abetted by his self-promoting, syntax-fracturing running mate, made maverick a dirty word. When I think they might have added their four years of loutish stupidity to George Bush’s eight years of homogenized stupidity, I break into cold sweats. Oh Johnny, we hardly knew ye. Let’s skip to the beginning: young John McCain was a son of privilege who was the black sheep of a family with a distinguished military legacy who distinguished himself by finishing fifth from the bottom of his 899-member Naval Academy class and crashing three U.S. military planes—before getting shot down in a fourth, which led to his capture and torture by the North Vietnamese. By all accounts he was stoic and heroic, and I have no doubt he deserved the awards and decorations and hero status he received for the physical abuse he bravely endured from his captors. But I can see how he could get under their skin. He gets under mine. John McCain is toxic. (In school, he was known as "McNasty.") 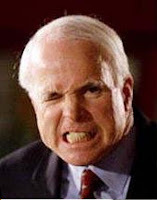 He may, by any definition, be a hero, but he serves John McCain. And it serves him now to rail and posture about the few issues he can sound knowledgeable about—earmarks and wasteful spending. Wasteful spending is the President of the United States spending and wasting good time reaching across the aisle for a man who is a toxic waste.